For a closer look at wholesale institutions, we split the sample into two groups once again: one group contains German Landesbanken (Sample: BayernLB, Helaba, HSH Nordbank, LBBW, NORD/LB), the other consists of “other wholesale banks” (Sample: DZ Bank, Standard Chartered, VTB). These sub-samples share some typical characteristics of wholesale business models, e.g. lower maturity transformation (in comparison to retail banks) and a high reliance on B/S related income, but they also show distinctive differences regarding the revenue split and the size and relevance of the deposit business. Figure 1 summarizes the main aspects of relevance for detailed analyses of these clusters. In general, the projected decline of the net interest income of wholesale banks will be slightly smaller than that of other business models, especially in comparison to retail banks. Wholesale institutions will reinvest their assets at nearly stable margins and will be affected much less by shrinking deposit margins, thanks to a lower overall share of deposits. However, this effect differs significantly between our two sub-samples. From a capital perspective, wholesale banks are of course also affected by adjustments to the risk-weighted assets (RWA) and tighter capital requirements, but the impact should be much smaller than for universal banks. This is due to the fact that loans—wholesale banks’ key position on the asset side—are less affected than derivatives or securities. With regard to low interest rates and regulatory changes, wholesale banks face smaller net interest income impacts than retail banks and lower capitalization consequences than universal banks. 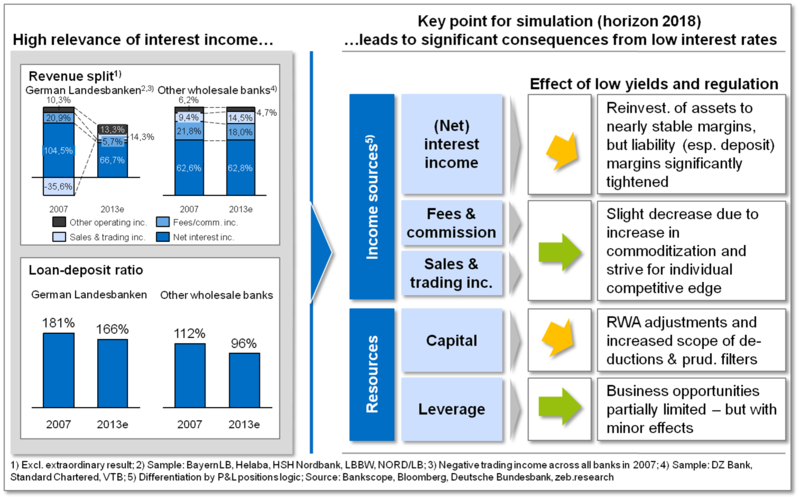 Our simulation provides some further insights, starting with the baseline scenario for German Landesbanken (figure 2). The results show a mixed picture. As even initially expected, low interest rates will only lead to a moderate decline of the net interest income of 6% until 2018. 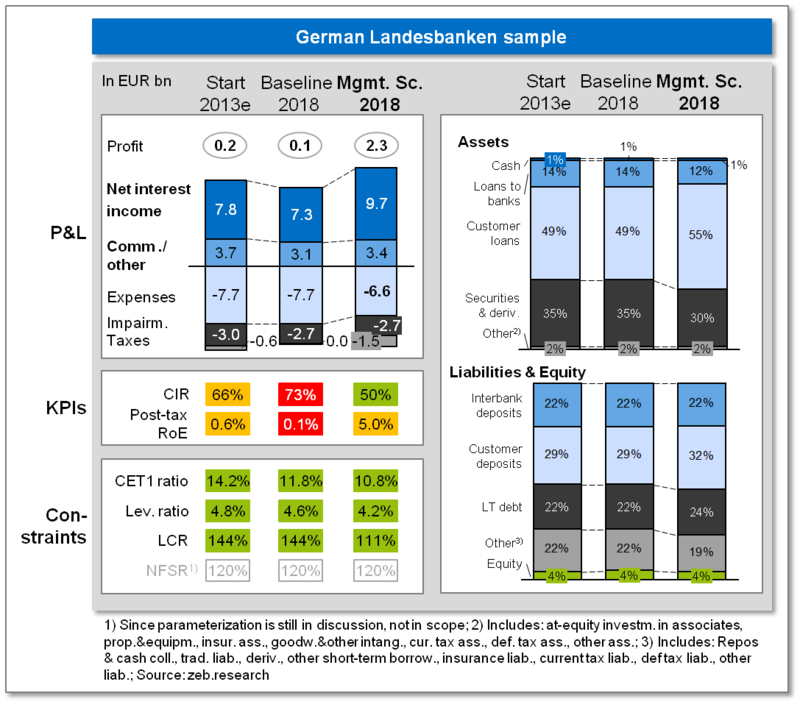 Due to this specific structure, German Landesbanken show the most stable net interest income among all business models. Based on this baseline scenario, post-tax return on equity will nevertheless drop from currently 0.6% in 2013 to only 0.1% in 2018. Despite the low profitability, the capital base of German Landesbanken will remain comfortable thanks to its initial strength. Liquidity will also remain comfortable and even the leverage ratio will remain at a moderate level. Overall, the key focus of German Landesbanken for the future should therefore indeed be on addressing the already low and even further declining profitability. These results do not fully apply for the second sub-sample, the “other wholesale banks”. The structural differences presented above (see figure 1) result in somewhat different consequences for these institutions compared to the first group of German Landesbanken. Especially the significantly higher share of deposits compared to the loan business, underlined by the lower loan-deposit ratio, will play a major role here. The baseline results make this clearly visible. As expected, the interest income of other wholesale banks decreases by more than 15% and total profits decline even stronger, by more than 35% until 2018. The currently good profitability of 10.8% will drop to only 6.1% in 2018. This negative effect would be even stronger, but it will be mitigated by a relatively high share of non-interest income and an expected decline of loan loss provisions over the next years. Especially in comparison to other business models like universal banks, Basel III capital requirements have a rather moderate impact on other wholesale banks – as capital ratios remain nearly stable – and the leverage ratio is well above the required minimum. The liquidity level remains below the hurdle rate, which will force certain banks to make some adjustments to the current balance sheet composition in order to meet regulatory requirements. On average, the major challenges for the wholesale banking business are drastically declining profits and therefore dropping returns on equity. A smaller number of institutions may also have some problems with liquidity and capital requirements, depending on their current book structure and capitalization. Now, the question is what managerial actions are necessary to compensate this expected lack of profitability and efficiency? We will analyze this by focusing on German Landesbanken, which in our baseline scenario showed a fairly low return on equity with a tendency to decrease even further. Figure 4 summarizes ambition levels and required actions assumed for the purposes of our projections. To increase profitability, significant sales improvements and cost cutting programs are necessary. For this scenario, we assume a drastic increase of fees and commission income by 40% until 2018, a significant cutback of personnel costs by 20% and reductions of the operating expenses of 10%. In addition, the relatively good capitalization and liquidity situation of German Landesbanken allows for an increase of high margin positions funded by additional long-term debt. The combination of these measures—each of which is already painful enough on its own—marks not less than a paradigm shift. Only a significant change to the business model will bring about the projected increase in sales and fee income and the required shift towards non-balance sheet-related revenues. Our calculations provide some further details on this. With the suggested combined management actions, we expect a post-tax return on equity of 5.0% and a cost-income ratio of 50%. 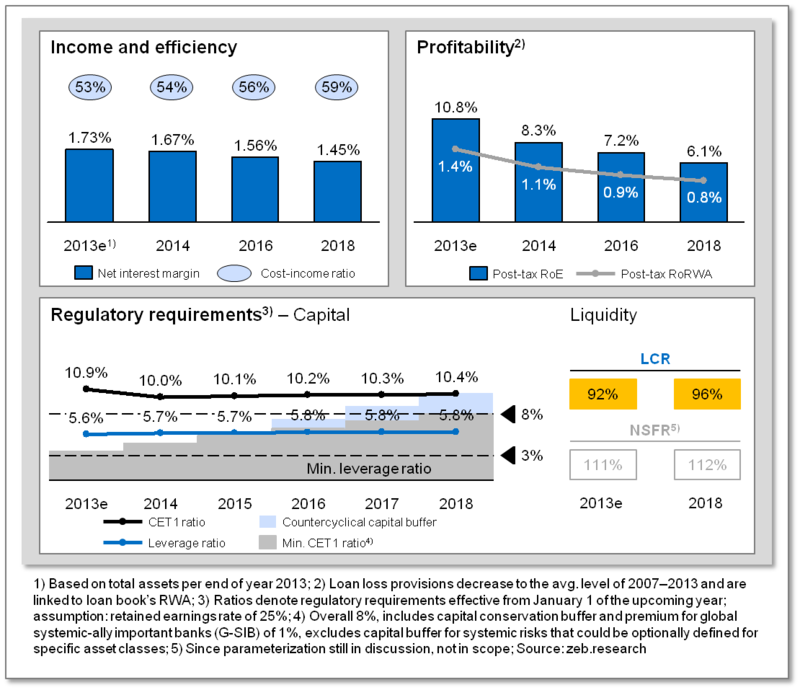 Regulatory requirements will still be fulfilled, but the higher profitability is achieved at the expense of the capital ratios, with a CET1 ratio of now 10.8% (down from 11.8% in the baseline scenario) and the leverage ratio decreasing to 4.2% in 2018 (from 4.6% in the baseline scenario). 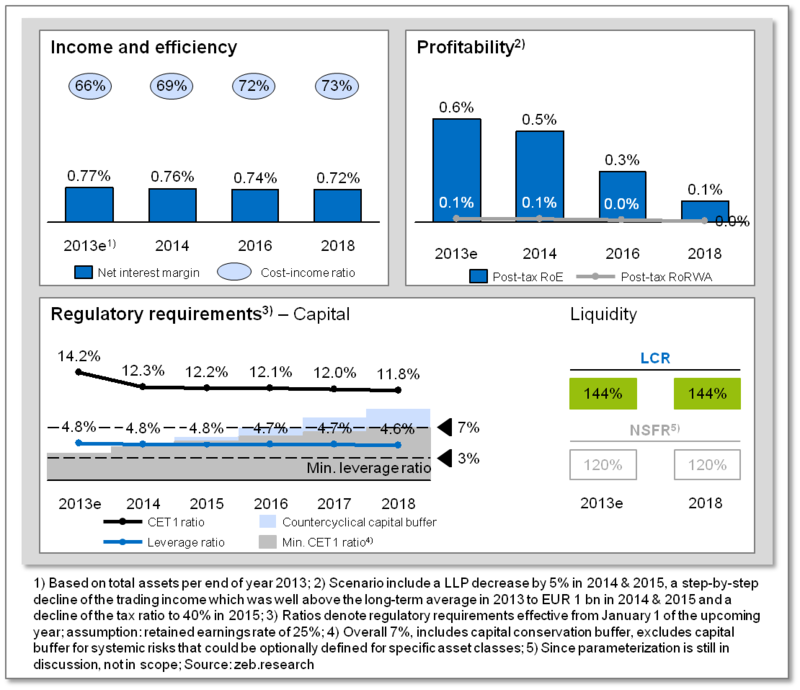 Overall, capital and leverage ratios remain above the regulatory requirements in this scenario. The liquidity situation of German Landesbanken will remain comfortable even after the proposed B/S shifts. To summarize the impacts of depressed yields and regulation on wholesale banks, overall higher capital requirements imply an optimization of the balance sheet. Internationally active wholesale institutions suffer from the regionalization of regulation which limits the fungibility of funding resources. The OTC reform requires banks to provide significantly more collateral. With regard to operating issues, the strong link between balance sheet and earnings power necessitates a reduction of infrastructure costs. Beyond that, tier-2 players have to streamline their operating model with a particular focus on sales and trading business. However, the OTC reform in the securities business also provides opportunities for new business models which hold advantages for large-scale players. Within the wholesale banking business, balance sheet-driven business models will not be sustainable. We can also expect a bifurcation of business models; the concentration of some large-scale players creates opportunities for niche players with regard to specific products and areas. The much needed emergence of new supply chain solutions will improve the flexibility of the cost base. 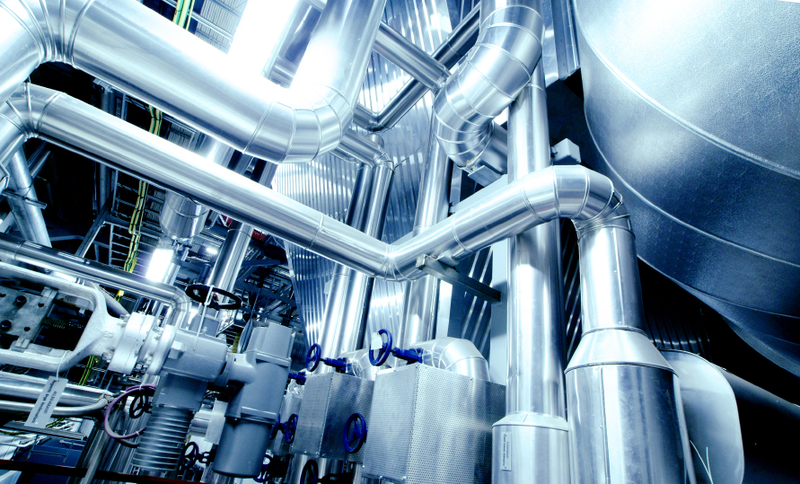 The new banking environment also offers new opportunities for established players, e.g. custodians in the OTC sector, or new players, e.g. institutional investors as credit providers. 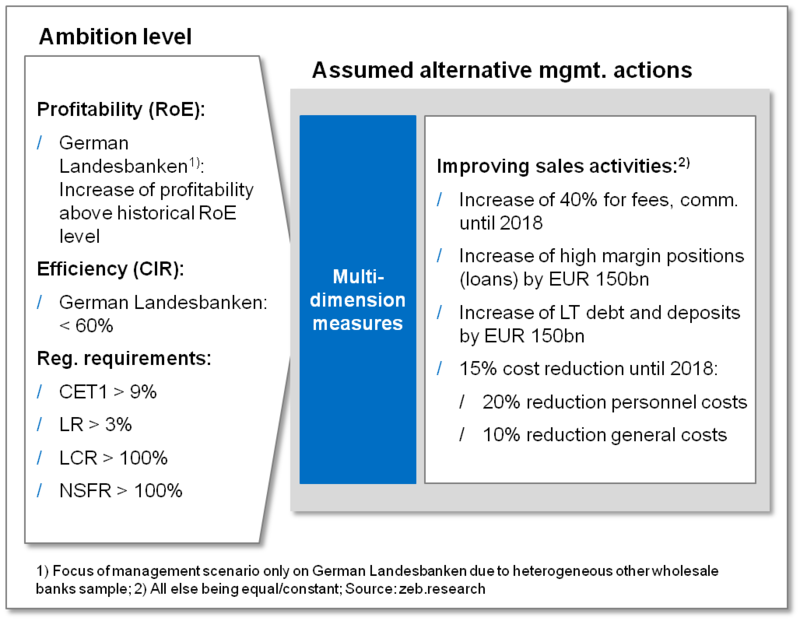 In addition, focus of management scenario only on German Landesbanken due to very heterogeneous other wholesale banks sample.